Eye Injuries – What Should You Do? 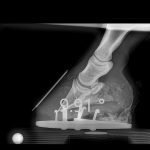 When considering equine emergencies, few people recognize just how quickly an eye injury can deteriorate if prompt diagnosis and treatment is not obtained. 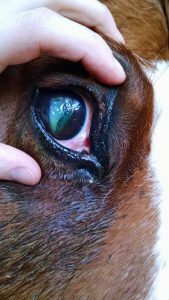 Indications that there may be an injury to your horse’s eye include discharge and drainage from the eye, swelling of the eyelids (sometimes to the point of the eye being swollen shut), mild squinting and even bulging of the eye itself. In rare situations, you may even be able to visualize damage to the cornea. If you notice any of the above clinical signs, the situation always warrants at least a phone call to your veterinarian. It could be something as simple as a bug bite to the eyelid or something as complex as a corneal ulcer. of the cornea. 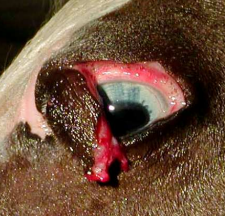 The type of stain we use binds to the underlayers of the horse’s cornea which in turn helps us to visualize any damage. This information will not only help us to better formulate a treatment plan but will also help us avoid using steroids in the eye. Applying steroids to an eye with corneal trauma can result in additional damage to the eye and prolong the healing time. Therefore, it’s incredibly important you check with your veterinarian first prior to using any leftover ophthalmic medication in your first aid kit! In many situations, a general triple antibiotic ophthalmic ointment will be enough to reduce clinical signs and promote adequate healing. In some situations, we will recommend additional ointments and solutions to use in the eye. 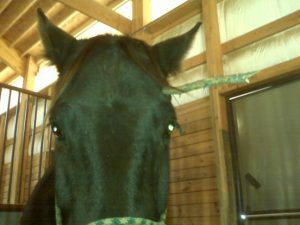 It is important to keep in mind that the environment of the horse’s eye changes every time he blinks. As such, eye injuries require much more frequent application of medications as the products are cleared from the eye at a faster rate than in/on other parts of the body. 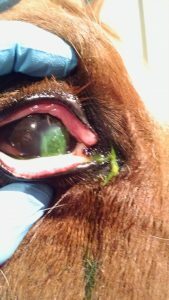 For those horses resistant to the administration of ophthalmic medications, we may choose to install a subpalpebral lavage (SPL) system. 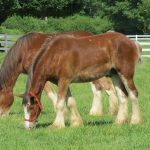 This consists of a tube that is installed beneath the eyelids and behind the eye and usually runs down the crest to a location away from the horse’s head. 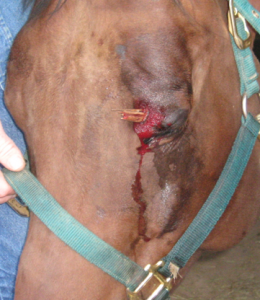 With this system in place, the eye can be treated without having to approach the horse’s head. There are added risks involved with using an SPL system but sometimes the benefits outweigh the risks, especially in chronic corneal injuries. When it comes to injuries surrounding the eye, we may be dealing with anything from an eyelid laceration to complete fracture of the bony orbit. Each situation is different and usually requires veterinary care. eyes can deteriorate at such a quick rate, it is usually better to call your veterinarian for eye emergencies instead of waiting a few days. The sooner we can start treatment of eye injuries, the better!